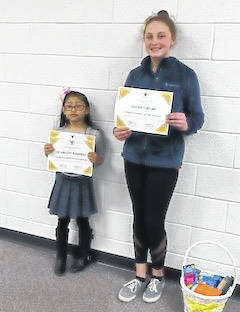 STORM Students of the Month recognized at the March meeting were Scarlett Ramirez and Lexi Grubb. RACINE — The Southern Local Board of Education approved the 2019-20 school calendar, as well as recognizing students during the recent board meeting. The 2019-20 school year will begin on Friday, Aug. 23 for students, following teacher work days and participation in a county-wide training day on Aug. 21. Open House is scheduled for Aug. 19 from 4-7 p.m.
Thanksgiving break is set for Nov. 27-Dec. 2, with Christmas break from Dec. 23-Jan. 3. The last day of the 2019-20 school year is set for May 22, which is listed as a professional development day for staff. STORM students of the month recognized were Scarlett Ramirez and Lexi Grubb. The board accepted the resignation of Elementary Guidance Counselor Andrea Wiseman at the end of the 2018-19 school year. Ronnie Quillen was approved as the Varsity Girls Basketball Coach for the 2019-20 school year. Daniel Buckley was approved as the Science Olympiad advisor. The board approved dock days for Kathy Miller and Kayte Manuel. Family Medical Leave was approved for Calee Pickens and Jordn Pickens. The transfer of Leslie Dunfee to the self-contained unit in the elementary was approved. Approved purchasing two carport shelters for the playground from the K-8 playground equipment fund. Approved a resolution accepting the amounts and rates as determined by the Budget Commission and authorizing the necessary tax levies and certifying them to the County Auditor. Approved the creation of a Drama Club fund. Approved donations from Coplin Health Systems and Farmers Bank for Career Palooza. Approved a professional services contact proposal from J.L. Uhrig and Associates Inc. for GAAP Conversion for the fiscal year ending June 30, 2019. Cost is $6,700. Approved the annual enrollment fee of $2,275 to be paid to CompManagement for re-enrollment into the Ohio SchoolComp 2020 Workers’ Compensation Group Rating program for 2020. This program includes both workers’ compensation and unemployment compensation claims management services and is sponsored by OSBA and OASBO. Approved an agreement with Holzer Health Systems to provide $5,000 for athletic training services for the 2019-20 school year. Approved the second reading of the changes, revisions or deletions to the Board bylaws and policies. Approved revised permanent appropriations in the amount of $12,523,958.99. Approved the minutes, bills, financial statement, bank reconciliation statement and all checks for the month of February. The next regular meeting of the board will be held at 6:30 p.m. on April 16 in the Kathryn Hart Community Center.